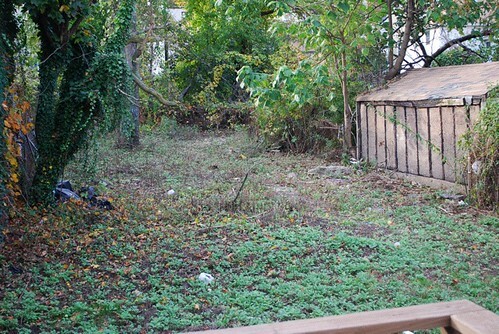 We just bought our first home in January and now have 3000 sq ft of backyard (and a few feet in front, too) to clean and fix up. We have NO IDEA what we are doing. So I hope you all donÃ¢â‚¬â„¢t mind if we pick your brains. I promise to share progress pictures! This is the backyard now. The little wooden shed is not ours. ThatÃ¢â‚¬â„¢s the neighbors. Their dead stuff is growing over into our yard so IÃ¢â‚¬â„¢m sure we have to ask permission to cut off whatÃ¢â‚¬â„¢s hanging over onto our side, right? Those sticks may be shrubs that die back every winter and then are wonderful again in spring and summer. They don't look like hydrangeas, but could be something along those lines. Can you rock one of those sticks back and forth, and does it then come up very easily with not very much root attached? Then they are probably dead and not dormant. They could also be the old stems of annuals that get a little woody, like sunflowers, also dead. Maybe hollyhocks which are biennial. I'm just guessing here, but if you haven't seen the yard in summer you don't really know what they are. Possibly the neighbors would be able to tell you. As far as the neighbors plants spilling over into your yard, the ordinances vary by municipality. You probably have the right to trim back anything that is over your fence line or lot line, with the likely exception of pruning something so severely that you would kill it. So if a spruce tree grew on the lot line, you couldn't shave off a third of the branches down through the trunk, thereby killing the tree just because it was over the property line. You'd have to consult with the neighbor, possibly get a variance. But viney, weedy growth, or wayward branches are fair game for you to trim. Getting a big tree out with so little property almost certainly means you will need a permit, and a licensed tree service will be your best bet. If you are absolutely sure you have the tools, the strength, the manpower, the disposal, and the means to take out a tree, go ahead. They just have a way of doing the unexpected, like wiping out a fence or coming down on power lines. It looks as if you have some ivy like plant growing up the truck of the tree which should be removed but that could be a problem since the roots could go on forever. You might want to cut back as much as possible and then apply some weed killer type of spray to the ends, possibly Roundup, but if you use that make certain it is the right type of Roundup. You can lay cardboard over sections of the yard at a time to smother the vegetation, except for the vines then replant what ever you chose. The vine will be tough especially if it starts in the neighbors yard. I would be patient. You want to identify where the sun hits your yard and what part is mostly shade. You also want to see what is already planted and dormant right now. I suggest you determine where you want a garden room or sitting area. Build a floor for it and a nice path to it. Also build your parking pad. This should occupy enough time to see what is in your yard. I would put up a 6 foot fence if allowable to hide your view of your neighbor. Prune some of the lower limbs of your trees up to a height taller than you so you don't run into them while mowing or playing. Any excessive vines should be removed, but determine if any are Clematis vines which can be quite beautiful. Most of us started with a blank slate. This was bare ground 10 years ago. Another thing I would recommend, buy a bunch of back issues of Garden Gate magazine, it is a big help for beginners. That is a really pretty back yard photo there. Don't we all wish ours looked like that! Lots of work went into that. You may trim any thing that over hangs your yard; any thing barring town codes or neighborhood restrictions. Cut and kill that ivy it will take over and kill you trees. The little sticks are the left over remains of last years plants. Off hand I would think some perennial, meaning it will come back from the roots. Perhaps something in the mint family, bee balm etc. If it is starting to be spring there, check around the base of the sticks for new little leaves and shoots. If so, you might want to wait and see what you have before getting rid of it all. 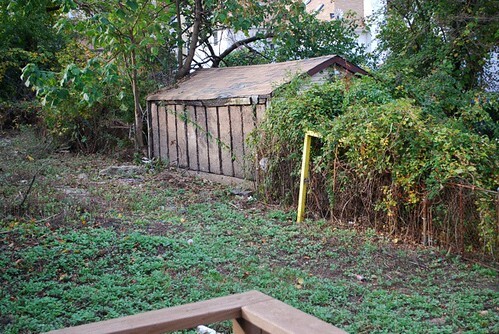 Between the shed and the shrubbery, your yard looks a little shady. If lawn is what you want, look for more shade tolerant grass varieties. 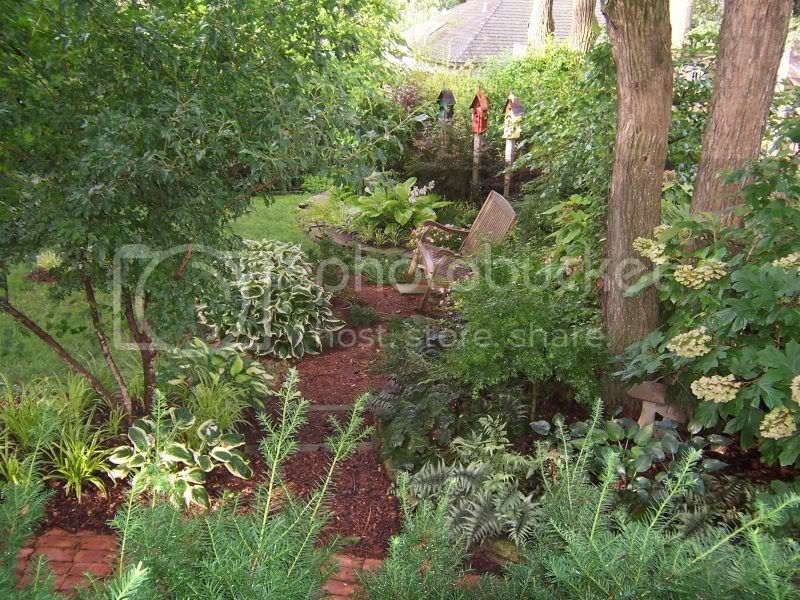 Otherwise you might think about putting in some shade tolerant ground cover type things at least in some of the area... ground covers you don't have to mow or do anything with.